Almost one month after two police corporals were slapped with a total of 38 misdemeanor charges in relation to the massive driver’s license examination scam, a Police Sergeant was this morning slapped with 12 counts of felony. Alfred Park, 50, of 1129 Diamond, East Bank Demerara, a serving member of the Guyana Police Force (GPF), appeared before Principal Magistrate Judy Latchman in the Georgetown Magistrates’ Courts. It is alleged that on April 12 at Georgetown, with intent to defraud the Public, Park conspired with persons to commit a felony, to which he utter 12 questionnaires, knowing them to be forged, in that it was not written by 12 persons, whose names they were in. Park was not required to plead to the 12 indictable charges after they were read to him. 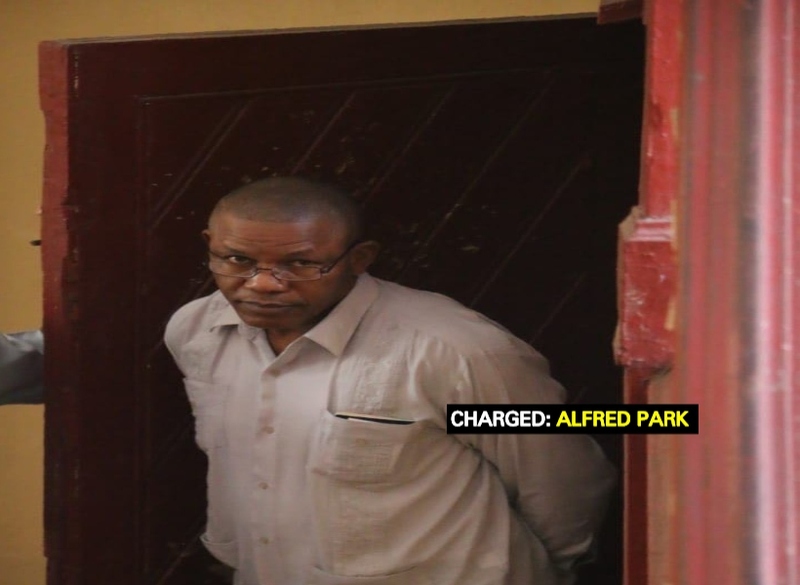 Attorney-at-law Patrice Henry, in an application to secure bail for his client, told the court that Park is still a serving member of the GPF and has been for the past 30 years. Police Prosecutor, Quinn Harris, had no objection to bail being granted to the Park but asked that it be in a substantial amount. The prosecutor cited the serious nature of the offences. He added that conditions be attached to the bail. Magistrate Latchman, after listening to the prosecution facts, granted Park bail in the sum of $1.2M. He was instructed to make his next court appearance on August 27, for report. Park upon hearing that he was placed on $1.2 M bail pleaded with the Magistrate for a bail reduction citing that he is in no position to afford such large sum. Park went on to tell the court that his colleagues were slapped with more charges and are currently out on a smaller bail. The Magistrate, after listening to his pleas, told Parks that she will not be reducing that bail. According to information, on the day in question, Park was responsible for invigilating the examination. It was reported that on April 12, last, a total of 174 candidates were slated to write the theoretical exam at the Felix Austin Police College, Georgetown. The court heard that on the day of the exam only 106 candidates showed up. However, on conclusion of the exam, it was discovered that a total of 207 examination papers were submitted. An investigation was then launched after the pastors who invigilated the examination told officers of the wrongdoing. On July 27 last, Police Corporal Shenese Fraser, 31, of 199 Section ‘A’ Field 7 South Sophia and 25-year-old Ryan Gray, a Police Corporal of 215 DaSilva Street, Kitty, appeared before Chief Magistrate Ann McLennan, where a total of 38 charges of misdemeanor were read to them. They too were not required to plead to the charges and Fraser is currently out on $150, 000 bail and Gray on $160,000. They were instructed to lodge their passports with the Clerk of Court. They were also instructed to report every Friday to the fraud section of Criminal Investigation Department (CID) until the completion of the trial.